Students Give Couplets A Try (And You Should Too!) 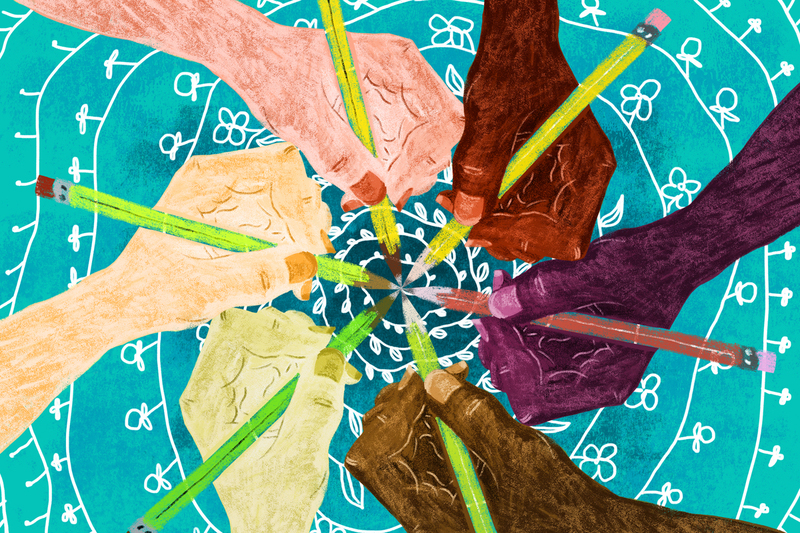 : NPR Ed Scores of students submitted their poems about teamwork to an NPR callout. Here are a few of the highlights. Students across the country responded to NPR's callout for couplets. "I thought it would be a great Monday morning warmup to have students try their hand at couplet," Morgan says. The class had already been celebrating National Poetry Month with readings by Shel Silverstein, envisioning how images match with the emotions of a poem and performing poems out loud. "I have a couple students in my class hoping to be professional writers," he says. "So, this [callout] got the students really excited." And it's not just students at Sinshiemer Elementary that were excited about our prompt. NPR received responses from elementary, middle and high schools across the country. But when I'm with my team it makes me want one more hour." A couple friends from the block and hockey pucks." It's all about being friends forever." because we are a team and we work together." I am only doing this for a little extra credit." —anonymous, Thurston Middle School in Westwood, Mass. Thank you to all the students and teachers who submitted their poems! We would love to see more. If you are a teacher who had your students create poems based on the Morning Edition callout, tell us about it by responding below or here. This callout closed in May of 2018.